The ANDI Bag is a stylish new tote that brings fashion and function together. I was able to build my own custom ANDI Bag for review. They have several colors to choose from. Customize the body of the bag, the straps, the accent, and the hardware to your liking. Be as conservative or funky as you want to be to match your unique personality! Folds up into its own pouch pocket: Like pictured above. Don’t worry, there are instructions on how to refold it back into that, too! Made of 100% waterproof material: Great for on the go. If you get stuck in the weather, your ANDI will be just fine. Machine washable: Extra convenient for me since I chose white. Many strap options: Carry like a traditional tote or use the included, detachable cross-body strap to carry it like a backpack. Travels well: There is a luggage strap to easily attach your ANDI Bag to your carry on. Safe keeping: There is a hidden pocket inside, right under the pouch pocket for cash or other important things. There are other pockets on the inside and outside, as well, for further organization. Temperature control: That’s right… the front pocket can act as a koozie for your hot or cold beverage! Single strap action: There’s a snap that can connect the two straps into one, so it stays on your shoulder better. As you can see this is way more than your average tote bag. Aside from being able to customize it yourself, it’s the ultimate bag for so many activities. I will be using it at BlogHer for sure. The backpack option will save my shoulder from the pain I was in last year. When doing tons of walking and standing, it’s better to have any weight you are carrying more evenly-distributed. 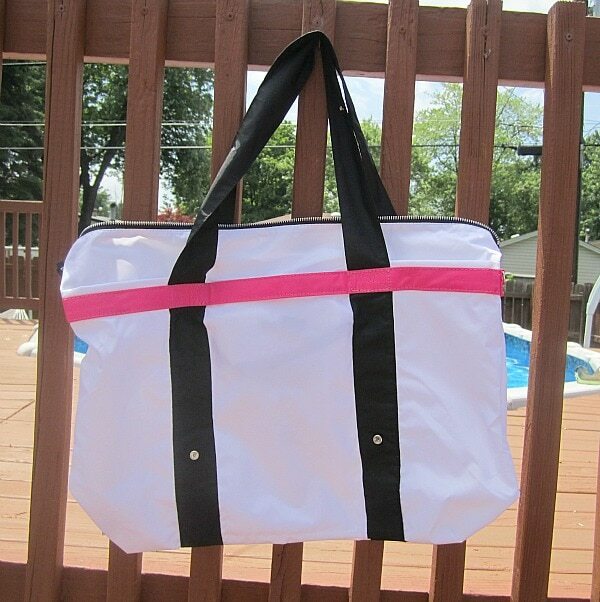 It will also be the perfect beach bag for boating and beach-visiting all summer. Since I can wash it, I am not worried about it getting sandy. It can go straight from fun back to work with me on Monday morning. Perfect! Stay in touch with ANDI on Facebook, Twitter and follow the hashtag #andiventures on Instagram. >>>What colors would you choose for your ANDI Bag? Hi Jennifer. I just wanted to wish you a Happy 4th of July! I hope it filled with plenty of fun or rest, whichever you need more of. lol. Your bag sounds perfect for traveling. It doesn’t take up much room in your luggage when you leave on a trip. Then you can fill it up with all your great finds to bring home. That is super cute! I could use this for traveling. How cool is that? LOVE the colors that you picked, I could definitely see myself sporting one of those! Looks great for traveling and the gym! i’d go with a blue base, (bright), lime green accents, pink handles, white strap and silver hardware. i laughed that one was named punky brewster!! I need one of these!! This is great! I love that you can customize the bag to fit what you want and need. Super cool. That is the cutest bag! I think I need one too! I like being able to customize things! Cute, I like that you can customize it! What a cute bag. Looks like something I would use as my beach bag! 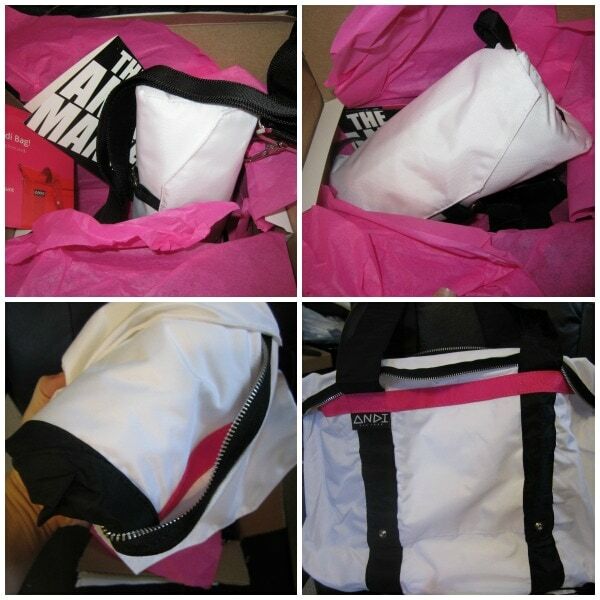 This is a really nice tote to take to the beach or on vacation because it will be easy to pack. Also I like that you can build your own tote the way you like it! Jennifer, these colors are TOTALLY me!! I think you were copying my blog colors! RIght? teehee! thanks for linking up! That’s great that it’s machine-washable. Somehow my bags always end up getting smudges from frequent use, so a quick wash would be a great perk. I would also appreciate the water-proof material and the ability to make it compact.